June is Dairy Month so I’m dedicating this week’s Wednesday Webs to the dairy industry and the delicious joy it brings to our lives. Here in Wisconsin we celebrate June Dairy Month in a big way. We have Dairy Breakfasts on the Farm with polka bands, baby animals and tractors. We have the Hoard Historical Museum’s National Dairy Shrine, where we celebrate the past, present and future of dairy farming. And, of course, we have cheese—lots and lots of cheese. Here’s a map of cheesemakers throughout the state. Many of them are small, privately owned dairies and visiting them is as fun as visiting a winery or brewery. So here’s to June Dairy Month and all the tasty treats that go with it! Here’s also to Jan, whose birthday it is today. Jan is my father’s wonderful wife and she is of dairy farm heritage. Dankers Dairy, that is, a farm in Saginaw County, MI, that years ago bottled its own milk. In bygone days, dairies bottled their milk in reusable bottles embossed or painted with their name and location. Nowadays, these are hot items for collectors (hey, there’s even a National Association of Milk Bottle Collectors). 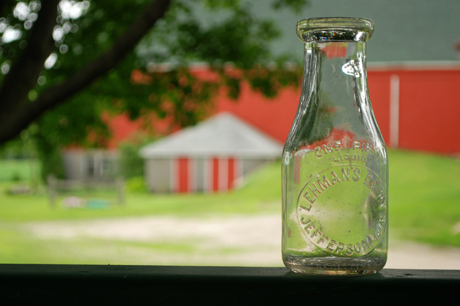 I have one lone bottle from Lehman’s Dairy in Jefferson, WI. Jan, on the other hand, has quite a few. But there’s one bottle she doesn’t have—one she’d love to have more than any other. She doesn’t have a Dankers Dairy bottle. Anyone know of one? Give me a holler and I’ll pass it along. I love the picture!! My Grandfather, Andrew Lehman started the dairy in Jefferson and operated it with my uncles and others for many years. Just seeing the picture of the bottle brought back memories of the stories that have been shared through the years. Craig, very cool about your grandfather! Family and local history are so fascinating. Thanks for commenting!